12v, 24v, 48v 1000w pure sine wave inverter with USB socket for your cellphones, chargers and other home devices. 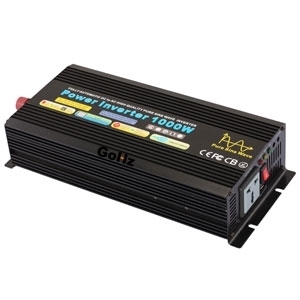 Tips: Does this 1000w pure sine wave inverter work with an AC-DC adapter? I think it extremely unlikely that a standard "adapter" type power supply would be suitable for feeding a power inverter load. This 1000 watt pure sine wave inverter load is highly non-linear, full of switching frequency current & harmonics, as well as harmonics, inter-harmonics and sub-harmonics of the input & output (50Hz & 60Hz) frequencies. Most, if not all, adapter style power supplies will not be designed to cope with all of this. The battery itself can have an important part to play in handling reactive/reverse power & current flows in a 'normal' rectifier-battery-inverter ("UPS") system. Therefore, I would strongly recommend that, unless the adapter is specifically stated to be suitable for sine wave power inverter loads, the answer should be "No".